The P700i comes a bit further down the line and has a 4.0-inch, 800 x 480 resolution display and dual-core MTK 6577 processor. The handset has a simple and minimalist look with the same exceptional build quality that we have seen on all Lenovo phones today. Like the S880, the P700i also feels a bit heavy but is manageable due to its size. Once again we see Lenovo's customized skin on top of Android 4.0.4 and this time it goes even deeper, with a completely custom design for the browser with tabs on top. Lenovo's aesthetic taste remains questionable, which makes some of these changes less than welcome. The dual-core processor on the P700i does a decent job and the phone manages to get around without getting bogged down. 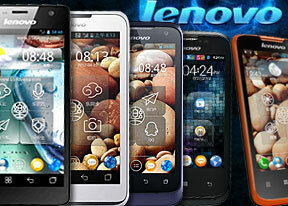 The Lenovo S560 is another MTK 6577-powered offering by the Chinese company. It offers a 1GHz dual-core Cortex-A9 CPU and PowerVR SGX531 GPU, which combined with the low HVGA resolution give you a pretty smooth ride. The Lenovo A60+ is the cheapest of the lot, which explains why its specs sheet isn't particularly exciting. A 3.5"� LCD of HVGA resolution at the front and a 1GHz Cortex A9 inside are complemented with a 2 megapixel camera and just 256MB of RAM. The A60+ also had a custom skin on top of the OS but it was different than what was going on with the rest of the phones here. It was also the only one running Android 2.3 Gingerbread, which is inexcusable despite the price tag. As for the performance, it was a bit of a mixed bag, with the UI lagging occasionally despite the presence of a dual-core processor. We think it's good that Lenovo decided to launch a phone at nearly every important price point but the phones aren't highly impressive. Other than the excellent build quality and the above average displays, we didn't find anything that stood well above the competition. It seems that Lenovo will need to work harder if it intends to attract a significant number of customers away from the dominant brands such as Samsung and HTC.